When you want to bring your love of hummingbirds into the house, this beautiful wall clock is perfect. The hummingbird is showcased in flight against a beige textured background. Simple, yet charming. When you want to show off your love of birds, adding little accessories and accents to your home is ideal. Even if your decor theme isn’t all about birds, you can still add those extras. Bird home decor is plentiful. There is no doubt about that. So you can simply add in a few or more decorative and functional pieces like a wall clock. Hummingbirds make beautiful decorative items in the home. Besides the one I featured above, there are others. In fact lots of others. 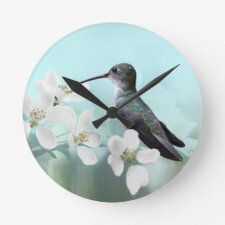 The talented designers at Zazzle are also hummingbird lovers. From gorgeous photos of these tiny birds in flight to modern art designs, you can find just about any design that works with your own home decor. I would have a hard time choosing between these lovely hummingbird wall clocks! All of them are beautiful and would make a great accent in the home of a bird lover. Wonder which one dad would like best… hummingbirds are his favorite! © 2019 Backyard Bird World. All rights reserved.